Dracula, which is to-day being transferred to the Garrick Theatre, is also now being played in the United States with success. 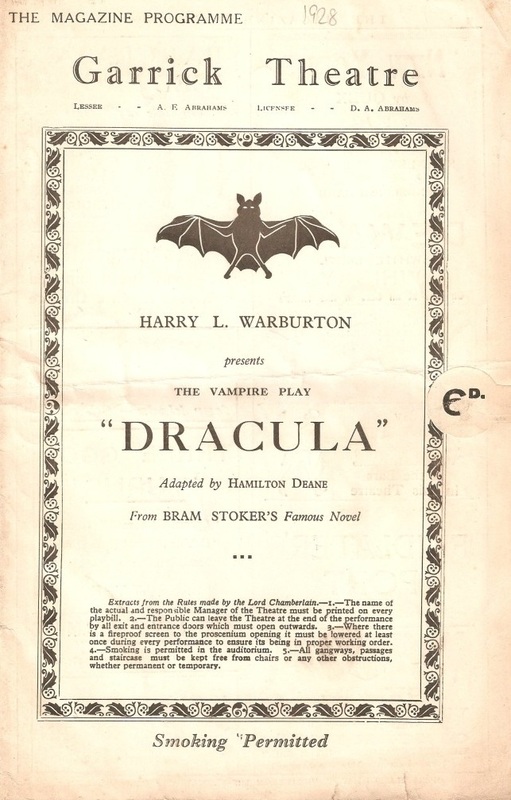 Dracula, at the Garrick, will reach its 350th performance on Friday, when it will for the first time be preceded by a monologue, called The Mountebank, which is to be recited by Mr. Norman Partridge. Dracula will end its run at the Garrick Theatre on Saturday, January 28, and will then be transferred to another theatre. Before being seen at the Garrick Dracula was played at the Little, the Duke of York’s, and the Prince of Wales. Dracula ends its run at the Garrick on Saturday week, and the company will then start a tour of the suburbs, beginning at Lewisham on January 30. On January 28 another company will be seen in the same piece at the Regent.